"Danny was a huge force in our early years," founding drummer Mick Fleetwood said. "... You will forever be missed!" LOS ANGELES — Danny Kirwan, a key force in Fleetwood Mac's bluesy three-guitar attack of the late '60s and as a singer and songwriter on the group's transitional albums of the early '70s, died Friday. He was 68. No details about his death were immediately available. The band's founding drummer Mick Fleetwood acknowledged Kirwan's passing in a statement for the group on his Facebook page Friday evening. "Danny was a huge force in our early years," Fleetwood wrote. "His love for the blues led him to being asked to join Fleetwood Mac in 1968, where he made his musical home for many years. "Danny's true legacy, in my mind, will forever live on in the music he wrote and played so beautifully as a part of the foundation of Fleetwood Mac ... Thank you, Danny Kirwan. You will forever be missed!" In a 2015 story for the New York Observer, writer and musician Tim Sommer called Kirwan "one of the great lost figures in rock history (both literally and figuratively)." In early 1968, at the age of 17, the South London-born Kirwan — who had showed formidable skill in the London trio Boilerhouse — joined the original Mac lineup of Fleetwood, guitarists Peter Green and Jeremy Spencer and bassist John McVie. In its earliest incarnation, the group was a leading light of the English blues scene. His first recorded work reached the U.S. on the 1969 compilation album "English Rose," which included the band's chart-topping U.K. instrumental "Albatross" and its B side, Kirwan's composition "Jigsaw Puzzle Blues." He held his own opposite Green and Spencer on the subsequent singles "Oh Well," "Rattlesnake Shake" and "The Green Manalishi," and his playing powered the classic 1969 set "Then Play On." A frequently bootlegged live recording of the three-guitar lineup captured at the Boston Tea Party in early 1970 showed off Fleetwood Mac's considerable concert firepower, also on display in a BBC performance of "Oh Well" from 1969. However, at around the same time, while on tour in Germany, the group attended a party where Kirwan and Green reportedly took LSD laced with a powerful ingredient that, according to Fleetwood and McVie, apparently caused significant changes in their behavior for years to come. 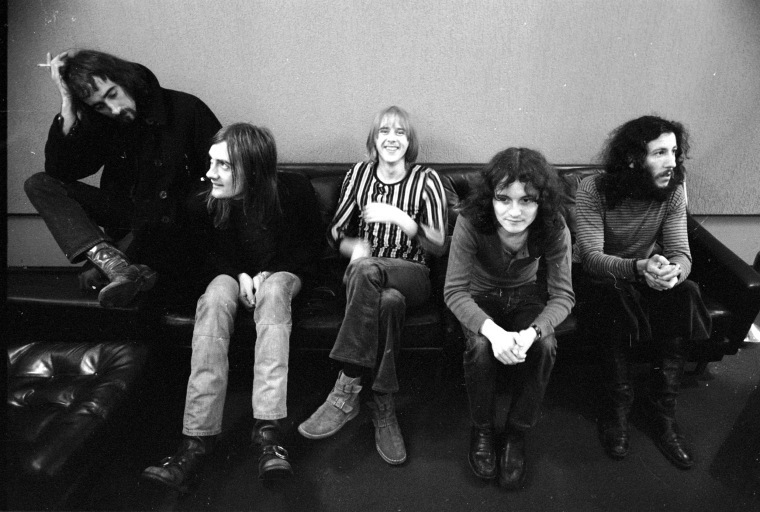 The tormented Green left the act soon thereafter, and the quartet lineup (augmented by keyboardist Christine McVie, who soon joined the band as a full member) issued "Kiln House" in the fall of 1970. The collection was highlighted by Kirwan's rolling composition "Station Man." Spencer became the next significant defection, bolting for an association with the religious cult Children of God, and he was replaced by American singer-songwriter-guitarist Bob Welch. Kirwan and Welch split the writing difference on a pair of elegant and underrated LPs, "Future Games" (1971) and "Bare Trees" (1972), to which Kirwan contributed such ethereal tunes as "Sands of Time," "Bare Trees" and "Child of Mine." Kirwan's escalating alcoholism led to confrontations with the other members of the band, including an altercation with Welch, and Fleetwood, who had become the acting manager of the band, fired him in 1972. He remained active briefly, recording unsuccessful three solo albums for the British label DJM in 1975-79. His recording career ended at that point; his alcoholism and severe mental health problems left him homeless for several years. He remained estranged from his former band mates, and failed to appear when he was inducted into the Rock and Roll Hall of Fame as a member of Fleetwood Mac in 1998. After Welch's departure in 1974, Lindsey Buckingham and Stevie Nicks joined, creating the best-known lineup of the group. Divorced, Kirwan is survived by a son.